Following the film, GABRIELA Seattle will host a panel and discussion about the impacts of state violence and militarism has on trans communities and ways that you can support. 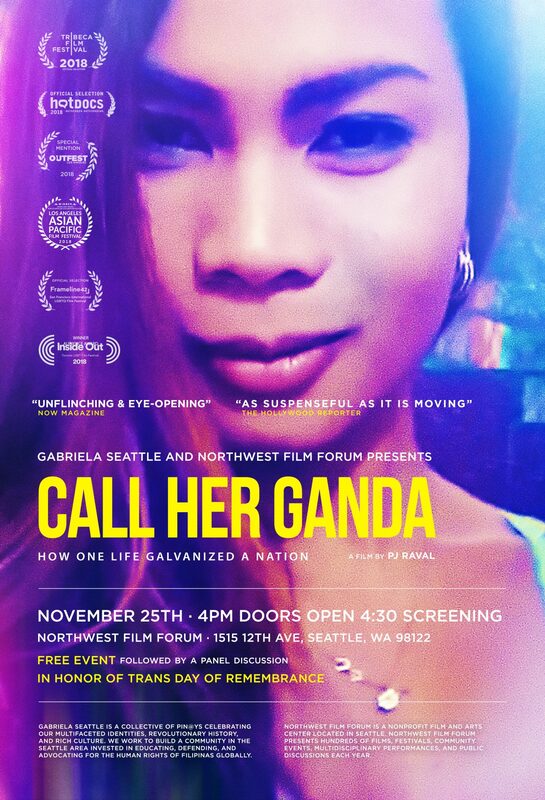 In honor of Trans Day of Remembrance (Nov. 20), GABRIELA Seattle and Northwest Film Forum present Call Her Ganda, a film by PJ Raval. In 2014, trans Filipina Jennifer Laude was murdered by US Marine Joseph Pemberton. Call Her Ganda documents the trial which attracted international attention, sparking a call for justice for trans people and an end to US militarism in the Philippines. Join us on November 25 as we unite to show up for the trans community and others oppressed by US militarism, resist the macho fascism of the Duterte and Trump administrations, and commit to fight and defend each other. GABRIELA Seattle is a collective of Pin@ys celebrating our multifaceted identities, revolutionary history, and rich culture. We work to build a community in the Seattle area invested in educating, defending, and advocating for the human rights of Filipinas globally. GABRIELA Seattle is a member of GABRIELA-USA, an overseas chapter of GABRIELA Philippines. GABRIELA-USA is an organization working to advance the struggle of women in the overall movement for national liberation and genuine democracy in the Philippines. For more information, contact gabrielaseattle@gmail.com or go to the Call Her Ganda website. View the official trailer here.